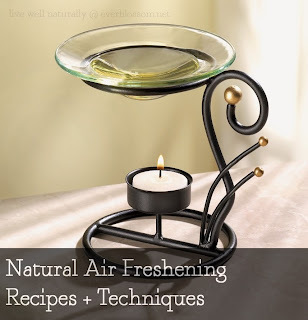 I like the smell of Febreeze and Scentsy pots and other fancy air fresheners but I'm also very aware that they put all kinds of weird chemicals in the air that I'm not comfortable with, so I've learned to use more natural methods of making our home smell fresh. Allow me to share my favorites! Using vinegar + baking soda to neutralize odors. No matter how many pretty-smelling tactics you use, they won't do any good if there are stink factories left unmanaged. For us, it's the cat's litter box and the bathroom garbage where we put diapers. So obviously keeping these clean is a big deal to me, but every so often I need to go a step further and give them a good deodorizing deep clean. White vinegar diluted in water works wonders for cleaning out the litter box and the garbage. I also sprinkle baking soda on the bottom of both makes them less stinky – I'll even add tea tree oil to the garbage, but not the litter box, since it annoys that cat. I don't really think about this method all that often, but herbal air fresheners are super effective and lovely – not to mention good for you! There are quite a few ways to go about using herbs and spices to fragrance your home. Grow your own. I don't do this, because my cat eats anything I ever try to grow inside, but I LOVE window herb gardens for the obvious cooking fun, but also because they seem to infuse the kitchen with their lovely herby smell when the sunshine pours in. Create an herbal sachet. Apparently these were all the rage “back in the day” for making clothes smell nice, but there's no reason not to carry on the tradition. I use my organic reusable tea bags from Natural Linens to make these! I just fill up the pouch with whatever herbs and spices I feel like using at the moment and tuck them into drawers, closets, pockets in the car, inside purses that I'm not using at the moment, under couch cushions… you name it. Simmer them. This doesn't seem to work very well for all herbs, but cinnamon, cloves, peppermint, and ginger (“hot” herbs maybe?) give off a very powerful fragrance when simmered in water on the stove. Did you know that a certain popular cinnamon roll chain found in the mall does this? They simmer cinnamon sticks to give off that amazing aroma and lure you in when you walk by. Pretty sneaky! This stuff is goooooooooooood and great for wishy-washy people like me who like to use lots of different scents. Basically, all you need to make your own all natural air freshener/fabric refresher is warm water, baking soda, your oil/s of choice and a spray bottle. Here are the measurements I use – I mix it up in a large mason jar first because it's easier to shake up really well and then pour it into my spray bottle. We're using warm water because it makes it easier to dissolve the baking soda, but it will still work the same after it cools down. Baking soda serves a couple purposes: it helps neutralize odors but also acts as an emulsifier to help the essential oils mix into the water – otherwise they would just float to the top. It's all very scientific – I feel very intelligent and educated when I make my homemade air freshener. You can also just warm a few drops of essential oils in a candle diffuser – no need to reinvent the wheel! There are a lot of these coming out that are super fancy and electronic but I'm happy with my simple tea candle one. I try not to use this method very often anymore, because I learned that it is a little hard on vacuum cleaners – BUT I'm still known to use it every so often, so I'll share. All you need to make your own natural “carpet fresh” is baking soda and essential oils. SO effective and much more baby-and-pet-friendly than the regular kind. Just add 1 cup of baking soda and 10-15 drops of oil/s to a jar and shake shake shake! You can use a fork or something to break up any clumps that show up… then just sprinkle on your carpets, wait a bit (I actually like to do this before going to bed and then vacuum in the morning, but that's just me.) and then vacuum it up. I especially like to use tea tree oil when I do this because I am really grossed out by carpet in general and feel a little better knowing that TTO is killing germs and mold and ickies while I sleep. Are you a little neurotic about the way your home smells like I am? What is the most “welcoming” scent to you? Thank you for these fresh air recipes! I also like a nice smelling home but don’t want the harmful chemicals that those plug in things produce. I use scentsy burners in every room of my home. It never occured to me that they might be putting off harmful chemicals. Thank you for this post and suggestions to clean the air in a more healthy manner. I am exactly the same way! I use the baking soda/vinegar methods often! I love lavender and vanilla (I just use vanilla extract and lavender oil). Yes – a very important consideration. Thanks for chiming in! I love a nice smelling home too, and we also avoid all artificial fragrances. These are great ideas because I’ve been lazy in this area, and I’d like to try freshening up the air in here in another way besides just opening up the windows! Just started using essential oils and we really need them because we’ve two dogs too! Thanks for sharing! The chemical smell is just unpleasant. I can’t wait to get my hands on some essential oils. My mom used to boil a little pan on the stove with cinnamon, and it was the best air freshener back then. Thanks for these recipes! BAKING SODA! Genius addition to homemade Febreeze. The Aura Cacia website has some nice recipes for scents. I’m addicted to trying new ones as well! I was wondering where do you buy your herbs from?